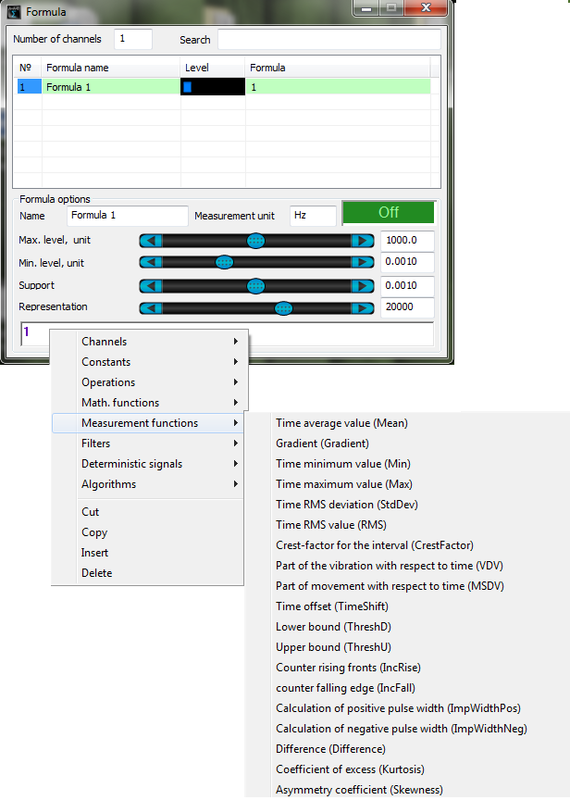 Measuring functions are intended for measurements of signals’ various parameters. Just like as for other functions of Formula program, the arguments can be set as equations. 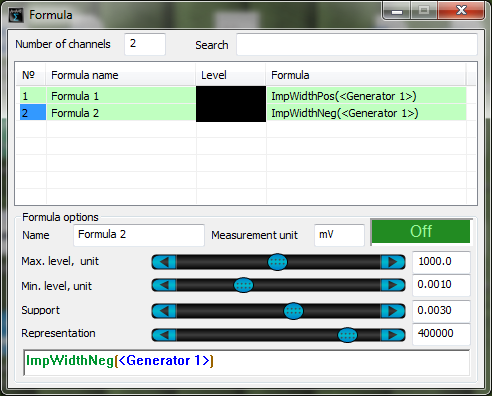 Mean(, t) – allows to find average value by the channel for a particular time period t (in seconds). Gradient (, t) – allows to define the slope of a straight line using the least square method. Min(, t) – allows to find the minimum value by the channel for a particular time period t (in seconds). 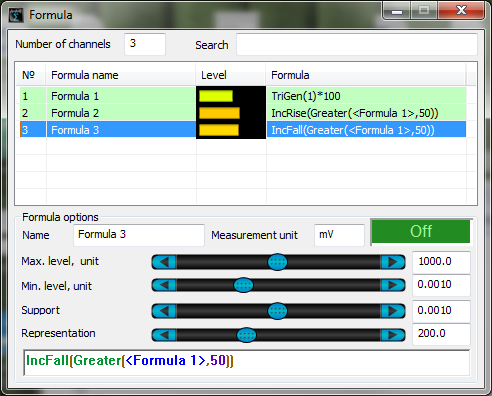 Max(, t) – allows to find the maximum value by the channel for a particular time period t (in seconds). In fact, these functions can be described as filters with AFR similar to the function sin(x)/x, where x is a reciprocal value of the set time interval. In the case, if this interval duration is more than 0,1 s, the values will be rounded with a precision of 0,1 s to the next larger value in order to accelerate operation and save program memory. StdDev(, t) –allows to find a standard deviation from the expected mean (square root from the dispersion) by the channel for a particular time period t. For periodical signals, it operated like a DC voltmeter. RMS(, t) – RMS signal level for time period t.
The figure below shows the result of functions StdDev and RMS operation, in which as an argument there is used a signal of the same amplitude, but with a different constant component level. CrestFactor(, t) – crest factor is used for calculation of signal peak value ratio to RMS with averaging by t (previous time period, seconds). The figure below shows an example of CrestFactor function operation. 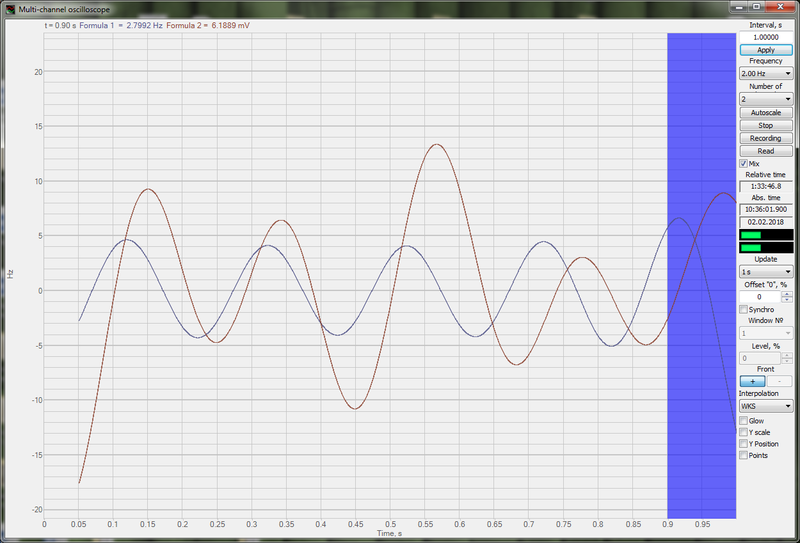 A sinusoidal signal is used as an argument. 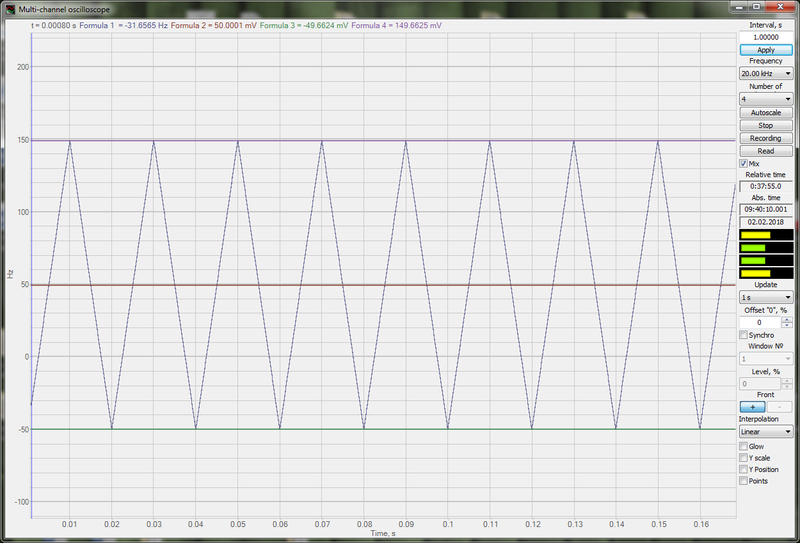 Its parameters (RMS and peak value) are measured by DC voltmeter. 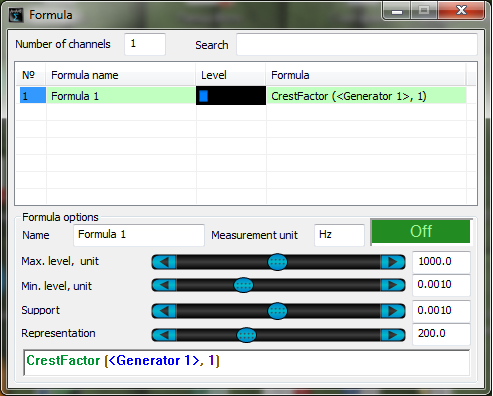 Operation results of CrestFactor function are displayed by DC voltmeter. VDV(, t) – vibration dose for time t.
MSDV(, t) – movement dose for time t.
Т – period of measurements. а0 – acceleration reference value, 10-6 m/s2. τ – exponential averaging time constant. maximum short-term RMS value (of remedial acceleration) MTVV: Maximum value of current RMS value of remedial acceleration for integration period θ, which is equal to 1 second. where Ф – is a total period of time during which low-frequency oscillations are observed (these very oscillations cause motion sickness). 1 Movement dose can be obtained from RMS value remedial acceleration value by multiplication by the ratio Ф1/2. 2 Unless otherwise specified, impact time Ф is considered to be equal to T.
where Ф – is the total duration of vibration impact. 1. 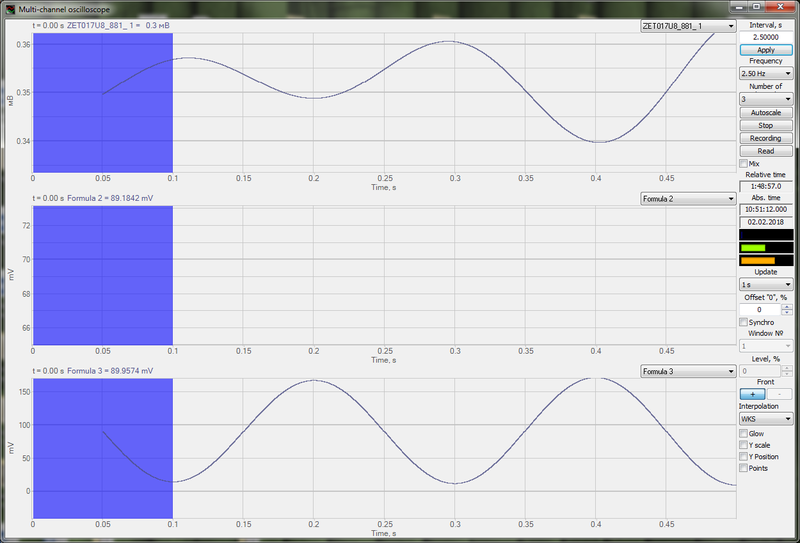 Vibration dose is more sensible to peak acceleration values than the RMS. Доза вибрации более чувствительна к пиковым значениям ускорения, чем среднеквадратичное значение. 2. Unless otherwise specified, impact time Ф is considered to be equal to measurements duration T.
TimeShift (, t) – time shift by the channel, for a particular period in seconds. The figure below shows the operation of TimeShift function. 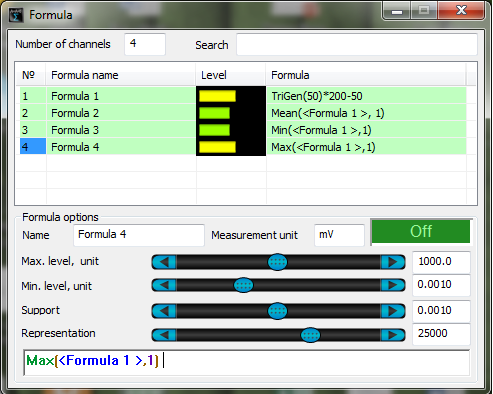 As a source signal, there is used a function SinGen (Formula1). 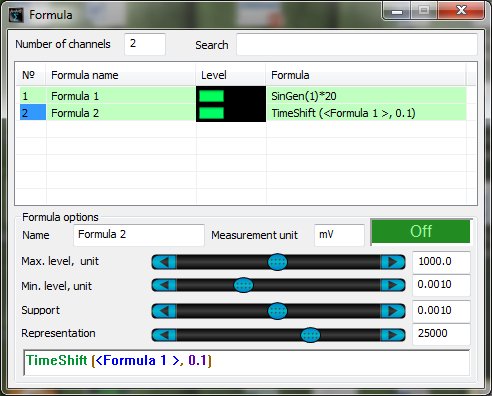 Timeshift is set for an interval of 0,1 s (Formula2). ThreshD (, const) – bottom limit of channel constant. I.e. all the values that are less than the constant level are substituted by it. ThreshU (, const) – top limit of channel constant. I.e. all the values that are more than the constant level are substituted by it. in order to set a negative value as a constant, one can use postfix inversion operator. The figure below shows a result of ThreshD and ThreshU functions operation. As a source signal, a triangular signal is used – it has an amplitude of ±300 mV (Formula 1). The bottom limit is -150 (Formula 2), the top limit: 150 (Formula 3). IncRise () – fronts counter (transitions from 0 to 1). IncFall () – cut-off counter (transitions from 1 to 0). It is necessary to use the logical functions Equal and Greater. The figure below shows an example of transitions counter operation. 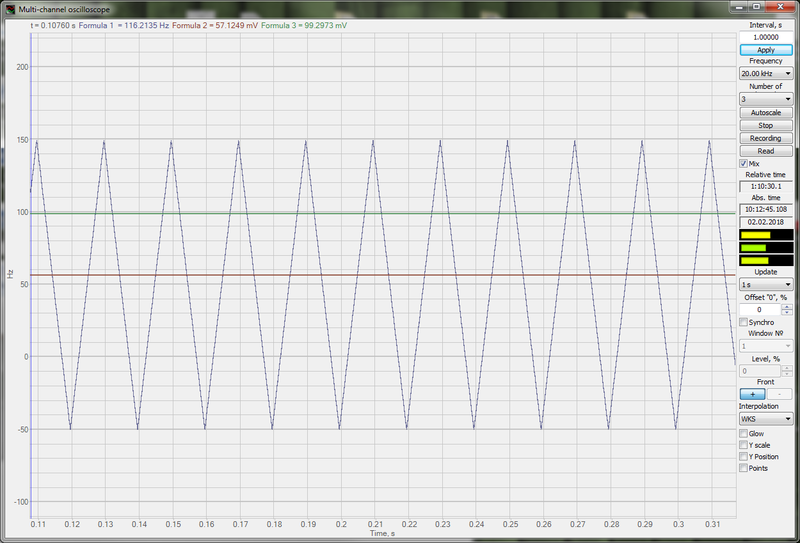 It is based on saw-shaped signal TriGen. 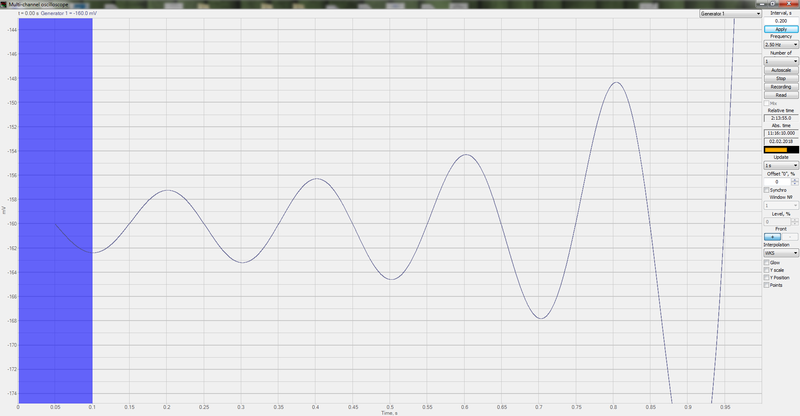 ImpWidthPos() – width of positive pulse in seconds. ImpWidthNeg() – width of negative pulse in seconds. It is necessary to use logical functions Equal and Greater. The figures below show an example of functions ImpWidthPos and ImpWidthNeg operation.